Gtechniq G Wash is a specially formulated shampoo designed to clean your vehicle, without damaging or stripping away your Gtechniq Coatings (i.e. C1, EXOv2). G Wash will break the bond of dirt and other contamination from the surface, while lubricating these dirt particles. This minimizes surface abrasion, allowing you to glide your wash mitt over your car without the fear of implementing new imperfections during the wash process. All it takes is 2 caps per bucket for light cleanings and 4 caps for cars that are more heavily soiled. This high foaming shampoo is the perfect maintenance cleaning solution, as it will not remove any sealant, coating, or wax, and it will also help enhance the gloss of any protection that is already on the surface. Once you are finished, dry off your car with a high quality microfiber drying towel (i.e. Waffle Weave Drying Towel) and you will be amazed at how clean and sparkly your car is. 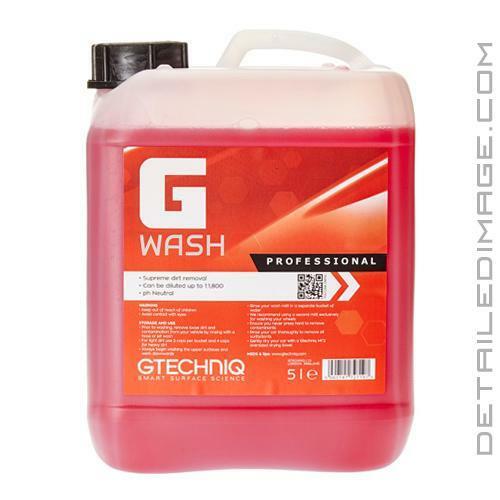 Retain the highest level of gloss and clean your car with ease with the Gtechniq G Wash! GWash has been specifically formulated to work in harmony with the Gtechniq range of coatings. One hundred percent biodegradable, GWash produces a high foam content which breaks the bond between the dirt film and your vehicles paintwork. The shampoo lubricates dirt particles, minimizing surface abrasion, maximizing gloss retention. I have used a lot of car wash/shampoo products, and gwash is hands down the best I have used to date. Seems to do a better job at removing dirt than any of the other car wash products I have used in the past. I have a Crystal Serum Ultra Gtechniq coating, and was told to use gwash for cleaning. I now use this on all my cars whether they have a Gtechniq coating or not, truly a fantastic product. I have Gtechniq coatings on my car and have been using CarPro reset in my foam lance, I liked the results but it made my wipers really chatter. I have not noticed that with this, it seems to clean as well as reset does. I guess for me I figure why not use the wash from the makers of my coating especially since it took me forever to apply.